Apple Tree Treehouse is nestled at the base of a beautiful apple tree set in the heart of a quintessential English country garden. This magical little treehouse brings to life every young child’s whimsical dream of a secret den. 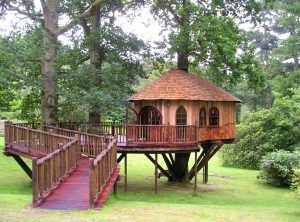 The expertly designed treehouse creates a fairy-tale feel within the garden, and is not only an elegant focal point perfectly positioned in the centre of this picturesque garden, but is also the perfect hideout for the grandchildren to enjoy. 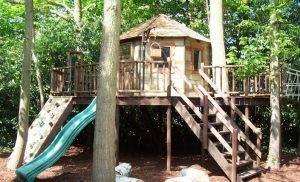 Apple Tree Treehouse is nestled at the base of a beautiful apple tree set in the heart of a quintessential English country garden…. The Apple Tree treehouse is built to an exceptionally high standard with a combination of Cedar tongue & groove lining and hand-cut Cedar shingles adorning the exterior. The copper roof and finials create a magnificent feature as they peek through the leaves at the top of the apple tree. 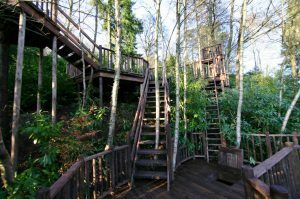 As you climb the timber ladder you are welcomed into this enchanted treehouse via a rustic timber play deck. Complete with fireman’s pole and basket & pulley the children can transport their treats and toys into their own little world where imaginations run wild and fun and adventure abound. Interior oak flooring and oak framed windows create an inviting atmosphere, with a cosy window nook being the ideal spot for children to curl up with their favourite toy and dream up magical adventures.